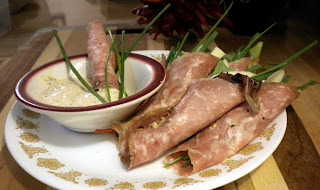 Here are some easy Salami and Swiss Tuscan Twists that are great for a dinner party or appetizer. I actually enjoy them as an easy watch some TV on the couch snack. One of those meals you make when dinner just seems like too much of a hassle after a long hard day. Enjoy! Mix all ingredients in a small bowl and chill until ready to use. Spread 1/2 tsp of sauce on the inside of each Salami slice. Evenly distribute the rest of the twist ingredients onto each salami slice and roll up tightly. Lay twists out on a serving plate and use the remaining sauce to dip in the twists and enjoy!